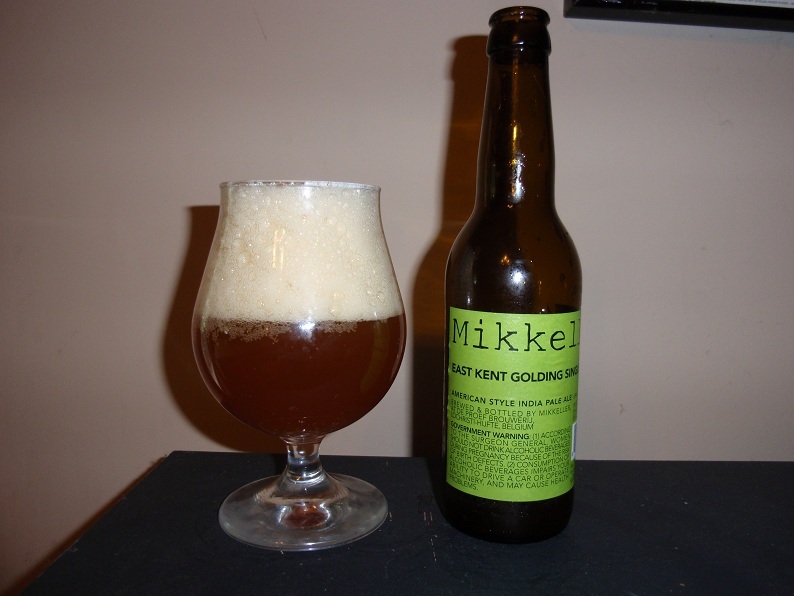 Mikkeller is one fine brewery from Denmark and their Single Hop Series is one of my favorite. So I was very pleased to find this brew on the shelves of South Lyndale Liquors a few weeks ago. East Kent Goldings are a classic English hop traditionally used in English Bitters and Pale Ales and I am excited to experience them in their pure glory with this IPA. This cleanly labled 11.2 oz bottle has 22/12/11 printed on its cap, which I assume is a best by date. When poured this carbonated ale quickly creates four plus fingers of bright white head that slowly opens up settling after a few minutes and leaving a good deal of lacing and about a half an inch of perpetual bubbles around the rim. Color is a modestly hazy apricot hue that is completely opaque. Smells as one would expect with a variety of herbal almost spicy esters and a earthy note that reminds me of orange rind. Tastes of hoppy herbs and spices and solid bitterness contrast with sweet malt esters creating one interesting brew. Again the herbal orange attribute comes through for me in the flavor quite notably. While this brew is obviously hop centric it is rather enjoyable if you are into herbal hops. With a 6.9% ABV it is plenty strong but not over the top for regular consumption. Body is medium and mouthfeel is quite carbonated but not overly sharp. Probably not a beer I would drink regularly because of its scarcity and serious herbal characters make it not as easy to consume by the 6-pack. Probably not the best hop to use on its lonesome but an enjoyable experiment. For those who enjoy variety, learning and sampling unique things this brew is absolutely worth your time. Give it a shot and ride your bike.